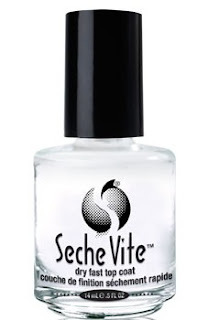 Okay, life changer may be a little extreme, but this Seche Vite top coat is the best out there for your mani. My big (sorority) sis Lindsay told our friends about how great this product is and the reviews I read online swear by it. My nails are shiny, hard and the color lasts days longer with less chipping. I'm good for ruining my manicure within minutes of leaving the salon because I'm so impatient and can't wait for my nails to fully dry. I bring this with me and within 5 minutes I'm good to go, no smudging. It runs around $10 and you can find it at the beauty supply or drug store that carries brands such as OPI or Essie. 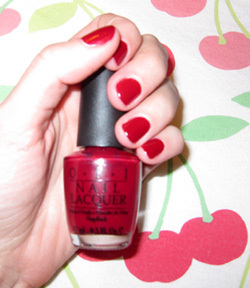 My color for the winter has been OPI Quarter of a Cent-Cherry , it's classic and cheery. Have you discovered a "life changing" product recently that I need to know about? Do share! I wouldn`t be able to survive without that top coat... okay maybe that's a bit too far but pretty true! Definitely a life-changer! I paint my nails two times a week just because it's SO EASY. My nails are completely dry in literally two minutes. Glad you finally picked up a bottle for yourself!